Even though I’ve only just hit 30 years old, in the media world I’m considered to be a dinosaur. You see, I’m part of the increasingly rare tribe that actually reads newspapers – and I don’t mean just online (although I have the New York Times and Washington Post websites open pretty much all day), but physical newspapers that come to my doorstep every morning. Part of this is a function of riding the train into work, so I have time to pore through the Wall Street Journal and the Chicago Tribune on a daily basis. However, there are also benefits that you get with a physical newspaper in contrast to browsing online – you’re more likely to encounter stories that are outside of your normal reading agenda and I’m perfectly content spending an entire Sunday with the fat weekend edition of the paper. That being said, while most of the world has been focused on Sam Zell’s quest to sell the Chicago Cubs at the maximum price (and nearly tax-free, no less) with Mark Cuban in the mix, his new plan for changing the newspapers at Tribune Company is particularly disconcerting and may have a more lasting impact on life in Chicago. (The Cubs have long been a marquee baseball franchise with deep pockets and a high payroll, which will continue no matter who the next owner might be.) The plan is reduce staff and close bureaus to slash costs and redesign the Chicago Tribune, Los Angeles Times, and other Tribune Company newspapers to make them more in tune with what focus groups supposedly say they want, which are more charts, colorful graphics, and shorter stories. This essentially means that Zell is looking to make the Tribune and its sister papers look like USA Today. The problem, though, is that he is advocating what we call in the legal world “form over substance” – that is, switching things around on a page but not really changing anything meaningful. There are really only three newspapers in the United States that have been able to weather the erosion of paper circulation in this country over the past three decades: the Wall Street Journal, New York Times, and USA Today. The Journal and Times have made their mark by taking the high road of in-depth investigative reporting and a commitment to resources both here and abroad. On the other hand, USA Today has famously gone after the lowest common denominator as the “McPaper” with lots of charts and graphics. One would think that more newspapers that try to make turnarounds would try to emulate the Journal and the Times, not just because of some amorphous ideal of high journalistic standards, but rather that they are able to charge a premium to advertisers because they draw readers with exceptionally high levels of income and education. This means longer-term revenue streams that are less susceptible to economic downturns. Certainly, the Tribune has long positioned itself as one of the elite metropolitan papers in the country. (Let’s contrast this with the Chicago Sun-Times, which has lately been putting out lots of hard-hitting stories, including this one referenced on the front page a couple of weeks ago. On a related note, I think all red-blooded American males can agree with this viewpoint.) Yet, every single story that I have ever seen about newspapers getting overhauled show owners going the USA Today route of slimming the paper down for the supposed masses. This occurs even though I have never met anyone that actually has a subscription to USA Today – it’s a paper that’s largely provided for free to travelers staying in hotels. 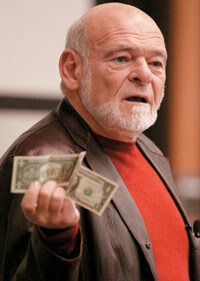 So, Sam Zell and a whole lot of other newspaper owners appear to believe that the path to success for local papers that depend on hometown buyers and subscribers is to emulate a model that has proven profitable for a publication that is passed out free to people while they are away from their home markets. I have worked with Zell’s old REITs before and believe that he is as shrewd of a businessman as anyone, but his approach to the Tribune Company is showing that real estate investment skills aren’t necessarily transferable to the media world. Here’s the mistake that nearly every newspaper owner in the country is making when they are trying to attract the elusive Generations Y and Z: they equate short attention spans with smaller papers containing fewer stories about substantive national and international issues and more blurbs about Hollywood. This is a ridiculous notion since when you take a look at the top 100 websites in the United States by numbers of visitors, you won’t see USA Today, Entertainment Weekly, TMZ.com, People, or any site focused on celebrity news on the list. However, the New York Times, BBC, and Washington Post websites are all on there. People over 30 fail to understand that people under 30 are the most media-savvy consumers anywhere and can instantly identify fluff versus well-written stories. While young people certainly like their junk food stories about the latest travails of Brittany Spears and Lindsay Lohan along with snarky commentary from a slew of blogs and other media sources, they also crave substance and they will turn to media sources that provide them with that. Even if you grant that physical newspapers are eventually going to go extinct and media companies should focus on the web, the success of the Times and the Post websites ought to be an indicator that going for the high-end of journalistic scale is a lot more successful in drawing readers (and the advertisers that pay for such readers) either online or offline than a bunch of cost-cutting measures and flashy graphics. So, as a Generation Y guy whose main complaint about today’s Tribune is that it has introduced too many empty journalistic calories (the What’s Your Problem? feature is more suited to a community flyer as opposed to the top paper in the nation’s third-largest media market that features multiple Pulitzer Prize winners, while the Trib’s Starbucks fetish has been well-documented), the path to long-term survival in the newspaper industry, whether it’s with ink and paper or on the web, is all about substance over form as opposed to the other way around. I followed the link to your blog from the comment you left at Drive and Dish. You’re doing great work at this site. I linked to this Sam Zell post, as well as your post about race, class and Starbucks in Chicago (a really strong post) at Drive and Dish and I’ll add a permanent link to this blog in the Drive and Dish blogroll. But Damn you for linking to that helmet project site. It’s one of the greatest sites I’ve ever seen, but I was going to go to the gym until I lost (at least) 2 hours while looking at helmets. By that time, the gym was already closed. Excellent analysis. Another good example besides the Wall Street Journal and NY Times and their respective web sites is The Economist out of the UK. Their circulation has increased 95% over the past 10 years, reaching their highest ever — 1.3 million readers — in 2008. People who are in the market for news are in the market for content — the best analysis, the best writing, the clearest format, the most up-to-date information. The downmarket design changes everyone and their mother is adopting out of panic and desperation has completely lost sight of why I, as a news consumer, would ever be compelled to purchase their product. Not to put too fine a point on it, but isn’t USA Today the highest-circulating, most profitable newspaper in America? God forbid someone would want to emulate that. Newspapers are business, not non-profit organizations. The boring old Trib (which everyone now seems to love) was losing circulation faster than the Cubs lose playoff games. And if so many people like Frank and Mike are lovin’ on the NYT, why is it hemorraging money just like the Trib? I think these pretentious snobs like to say they read the East Coast broadsheets because they think it impresses people. Ditto for the Economist. It sounds great to say your circ is up 95% percent over 10 years… which means it was a drop in the bucket to start with. I mean, 1.3 million worldwide is respectable, but the Trib sells almost a million papers EVERY SUNDAY in Chicago alone. Give me a break. “I’m part of the increasingly rare tribe that actually reads newspapers…” There’s 3 million members of your “tribe” in Chicago (based on recent Trib weekly readership numbers).